Tamarind juice ... 1 tbsp. 1. Grind coarsely the onion, ginger, garlic, mint and coriander leaves. 2.In a pan add a tablespoon of oil and fry the pastefor a while on low flame till the water is dry. 3. Add all the dry masalas, tamarind, salt and peanut powder.Let it cool. love the stuffing you have put in. they look delicious with all the yummy flavors going in there. Great dish with wonderful flavors !! Lovely and yummy recipe. Stuffing also good. 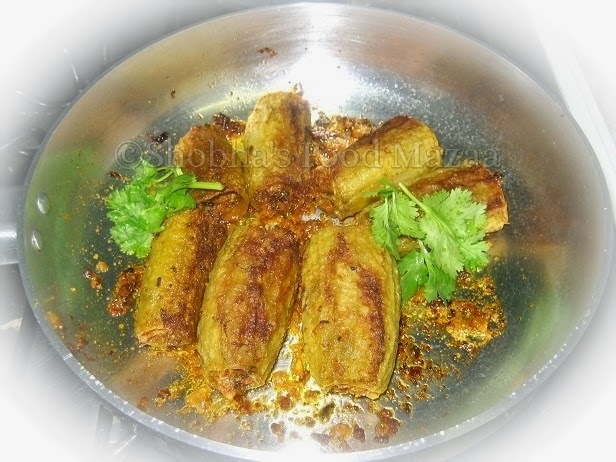 Fantastic dish,loving this stuffed karelas..
Luv to try this stuffed version..Sounds too good.. Stuffed karelas look good... I don't like karela but am sure my hubby would love this sabji. I am sure he will like themm.. you must taste a bit of it too and let me know.